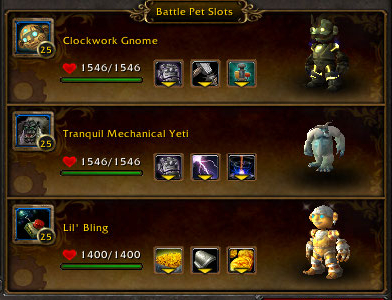 I’m fairly new to serious battling, so of your suggested pets, I only had Lil’ Bling. Starting out, I attempted the alternate team with a Mud Jumper for Swarm of Flies and a Wild Golden Hatchling. 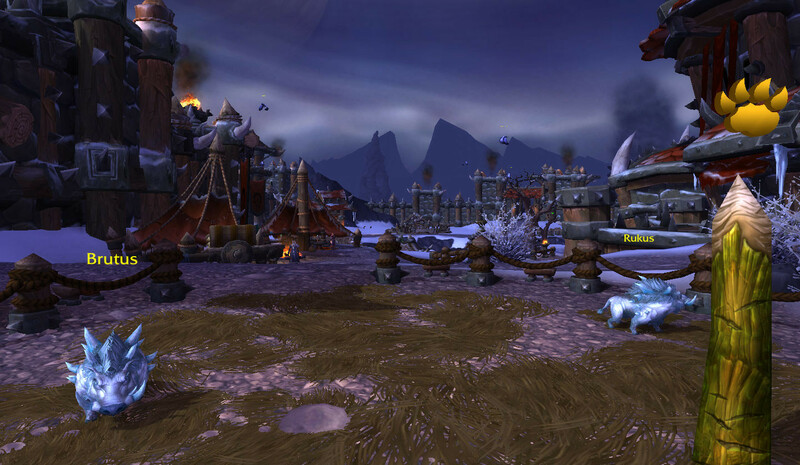 However, I found that, without the extra mechanical damage from the gnome’s turret, my team was dying too fast. Ultimately, I found success running the Golden Hatchling and the Menagerie Custodian for the latter’s Ion Cannon. I opened with the Hatchling’s Call Lightning and switched right to Bling, then applied Extra Plating before starting off on Inflation. While this was only enough to kill Brutus before Bling went down, reapplying Call Lightning, plus Lift Off to take the edge off Hunting Party, and then closing out with the Custodian’s Ion Cannon, got me the win. So I guess the conclusion I’d draw from that is that the Gnome is more important than you thought, so Ion Cannon is definitely great (maybe essential) to have as backup without him. Worked just fine I used the Lil Bling + Call Lightning and other pet with dots. Thanks! Great team as always really enjoy your guides! Iron Starlette, lil bling, Onyxian whelp also can carry the day here, although not consistently. lil bling is, indeed, the difference maker. 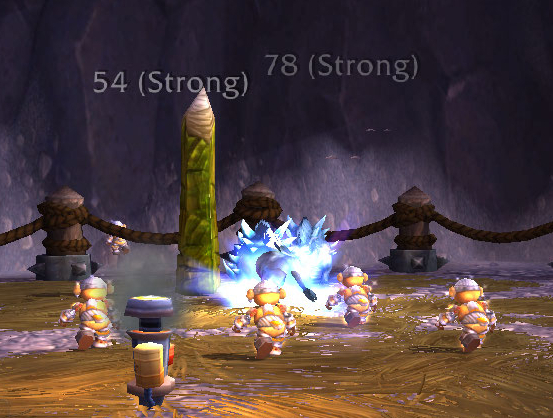 I found a second team that finished really strong: Darkmoon Zepplin, Darkmoon Tonk and Menagerie Custodian. The Tonk and Custodian both have Ion Cannon and will kill either Rukus or Brutus when at half health and the Decoy on Zepplin gives you a head start on Rukus. Also Tonk and Custodian has Shock and awe which crittted both times for me and doing at least 800 damage when it didn’t crit on one run. This just give some alternates that also work. In my experience, if things so sideways with Lil’ Bling dying too soon, Ion Cannon on top of Shattered Defenses is your “win or die” last gasp. That’s why I like the comp presented right here. Hi. Any reason you don’t start with Call Lightning? That way the turret does more damage for four turns. Call is still up for the Ion Cannon later, too. Just curious. skywisp moth for call lightening, robochick for wind-up, clockwork gnome for build turret… begin and end with skywisp and make sure you have up cocoon strike to dodge. haven’t leveled up lil bling yet but this works pretty steady in it’s place. You may lose robo-chick but once you’re down to one boar the skywisp handles this fight surprisingly well with the dodge.